Blue Ocean Technologies supplies high-quality subsea services for oil and gas wells worldwide, and has broken depth records riserless intervention multiple times (currently 8,200ft). Blue Ocean’s flagship interchangeable riserless intervention systems (IRIS) performs cost-effective and efficient well intervention that reduces costs and increases recovery. Blue Ocean Technologies offers riserless intervention for deep and ultradeep subsea environments, as an alternative to conventional rig-based products and at less than half the cost. An IRIS is suitable for water depths of 10,000ft and 10,000psi, and features a patented grease injection / sealing process, a closed hydraulic system and electric hydraulic controls via a purpose-built umbilical system. The IRIS is ROV operable and is suitable for horizontal or vertical trees. Blue Ocean Technologies has continuously developed IRIS over the past ten years to create the system available on the market today. Blue Ocean has achieved this by incorporating extensive field experience and has successfully performed intervention in waters up to 8,200ft depth. Blue Ocean performs a wide range of subsea services that can increase recovery while reducing costs. 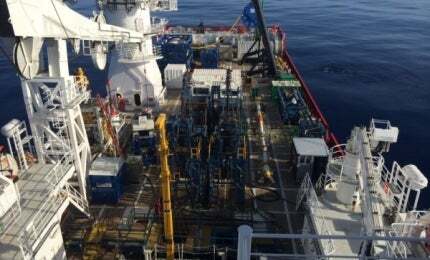 The company undertakes damaged well remediation, infrastructure diagnostics, well plugging and abandonment (P&A), subsea and riserless well interventions, workovers and sliding sleeve interventions. The IRIS live well logging facilitates use of subsea tools, such as wireline tractors, milling tools, logging tools and gauge rings to execute its services. Established in 2008, Blue Ocean Technologies is a pioneer in riserless subsea intervention. Focussing its operations in the offshore oil and gas industry, the company produces innovative solutions that meet the requirements of its clients and the most demanding wells. Blue Ocean Technologies’ management team has more than 50 years of experience in the field on top of extensive knowledge in subsea and well intervention. Additionally, the company’s personnel includes downhole wireline engineers, experienced subsea technicians, project managers and subsea engineers, who support clients throughout the intervention process, starting from the initial planning phase to post-job analysis. Blue Ocean Technologies has opened its new high bay and workshop at the company's headquarters in Conroe, Texas, US. Blue Ocean Technologies provides rigless riserless services to meet complex subsea challenges.